This technique directly images the propagation of light through an optical nanofiber, seen here as blue waves. The upper image is a zoomed out compilation of the Rayleigh scattering along the nanofiber. The saturated white section is the narrow neck of the nanofiber. Images courtesy of the authors. Optical nanofibers are optical fibers that have a diameter smaller than the wavelength of the guided light. Here, all of the light field cannot fit inside of the fiber, yielding a significant enhancement in the evanescent fields outside of the core. This allows the light to trap atoms (or other particles) near the surface of a nanofiber. Researchers supported by the PFC have developed a new technique for visualizing light propagation through an optical nanofiber. The result is a non-invasive measurement of the fiber size and shape and a real-time view of how light fields evolve along the nanofiber. Direct measurement of the fields in and around an optical nanofiber offers insight into how light propagates in these systems and paves the way for engineering customized evanescent atom traps. 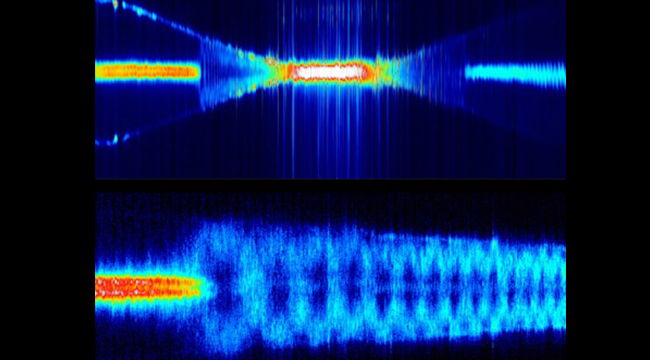 In this work, researchers use a sensitive camera to collect light from what’s known as Rayleigh scattering, demonstrating the first in-situ measurements of light moving through an optical nanofiber. By collecting images of the Rayleigh scattering, the scientists can directly see how the field changes throughout a nanofiber and also the effects of changing the pattern of light injected into the fiber. This technique can be used to measure the profile and width of the nanofiber. In addition, the team was able to use the imaging information to feedback to the system and create desired combinations of modes in the nanofiber — demonstrating a high level of control. Notably, this type of visualization is done in-situ with relatively standard optics and does not require destroying the fiber integrity with the special coatings that are necessary when using a scanning electron microscope. This could be useful for analyzing fibers where the propagation conditions change multiple times, or in the case where a fiber undergoes strain or bending during use. This also means these characterizing measurements can be used to optimize the fields that interact with atoms during experiments.